This is not Queen Titi, consort of Amenhotep III and mother of Akhenaten, but a queen of the Ramesside era. The tomb is damaged but some of the murals still retain startling freshness of colour. The figures of the gods and demons in the tomb chamber defy the years with their brightness. The tomb is simple, comprising an ante-chamber (I), a long passage (2) and the tomb chamber (I), which is flanked by three small chambers. 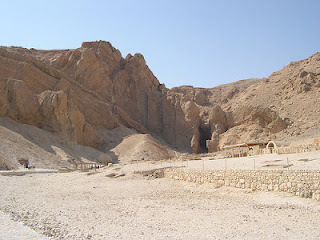 On the rear wall of the chamber flanking the tomb chamber to the right (a) is a representation of Hathor who appears in the form of ''a cow in a mountainous landscape. 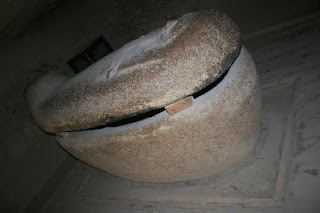 In front there is a sycamore from which Hathor, now represented in human form, pours out Nile water to revive the queen. 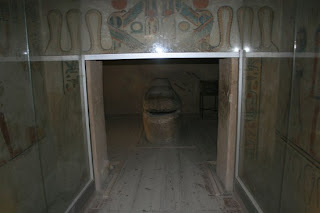 The chamber on the opposite side (b) contains the mummy shaft. The rear chamber (c) shows genii of the dead and various gods seated at offering tables while the queen prays to them (to left and right). On the rear wall Osiris sits enthroned with Neith and Selket before him and Nephthys, Isis and Thoth behind him.